Almost 25 years old, Stansted Airport Train Station has stood the test of time as one of the quickest and easiest ways to get to and from the airport. It has three platforms, two dedicated to the Stansted Express services that connect us to central London and one for other services. It’s super-easy to get between the station and the airport as the station is directly underneath the airport. 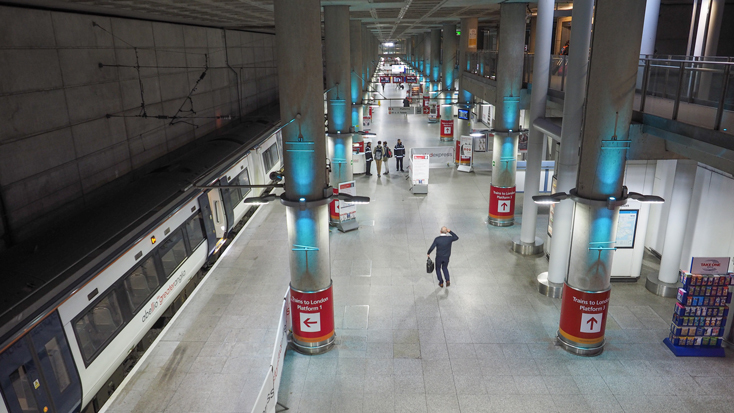 By using the lifts, escalators and ramps to transport your luggage, it can take as little as two minutes to walk between the station and the terminal. Tickets can either be bought online or from the ticket machines and rail information desk located in the station. However, prices can be steep on the day of travel so save money by pre-booking your train tickets online. Yes. Tickets can either be bought online or from the ticket machines and rail information desk located in the station. However, prices can be steep on the day of travel to save money by pre-booking your train tickets online. How do I get from the station to the terminal? Using the lifts, escalators and ramps you can get to the terminal within two minutes. There are clearly placed signs along the way to guide you. What if I miss my train because my plane was delayed? We strongly advise you to factor in extra time during your journey to allow for delays and other unforeseen circumstances. Some train operators will also let you use alternative services should you miss your train. However, we recommend contacting your train operator to check their policy. London Stansted Airport is staffed every day apart from Christmas Day. Induction loops have been fitted and the whole station has step-free access. If you require any more information or assistance at the station, please email assistedtravel@greateranglia.co.uk at least 24 hours before you travel. Services run to London Liverpool Street, Tottenham Hale and Stratford tube stations from Stansted. You will need to make a change, depending on which line you’re travelling on. There are several cash machines located on the concourse. Yes, there are several card and coin-operated payphones on the concourse. Can I connect to public Wi-Fi in the train station? Yes, there is a public Wi-Fi service running throughout the station. What food, drinks and shops are available? There are several vending machines located around the concourse as well as a coffee shop and a newsagent. What toilet facilities are available? The toilets are located on the concourse. There is an accessible toilet (non-RADAR) which can also be found on the concourse. Baby-changing facilities are available in the accessible toilet. Are there any waiting rooms? Yes, there is a large waiting room on platform 1 as well as several banks of seats throughout the station. How do I get to my closest city from Stansted Airport Train Station?